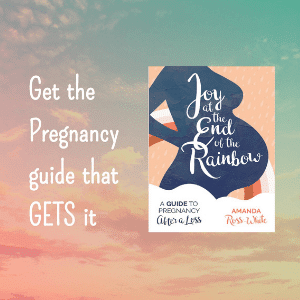 This post was originally published on my blog in July of 2012, when I was almost six months pregnancy with my rainbow son. I promised myself I wouldn’t buy any more baby things for Jake, our rainbow son. I was at the store, and when I passed by the baby section, I thought, why not? So in I went. And of course I found some adorable things, like some puppy-themed onesies and matching pants, and a fleecy dinosaur sleep sack. And of course I bought them. When I was at the store, I felt like a normal pregnant mama, happily planning for the safe and much-awaited arrival of her baby. Planning as if said safe arrival is guaranteed. But I know that it’s not guaranteed, that nothing is. I know that I am not your typical pregnant mama. Today I let myself indulge, let myself pretend. 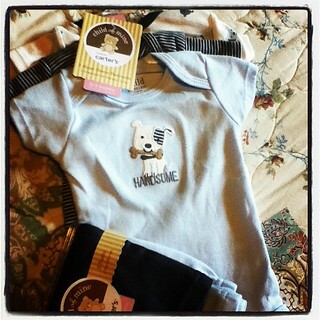 After all, our baby will need clothes to wear when he arrives. So it’s not even like I indulged extravagantly. But when I got home it suddenly began to feel extravagant. No, that’s not the right word — reckless. It felt reckless. To buy clothes for a baby who might not live to wear them? To pretend that I know what tomorrow holds for this pregnancy, much less next month or three months from now? When I got home, I stashed Jake’s new clothes in the bin where I’ve been storing the sweet gifts he’s gotten from friends and family, plus the few things I bought him early on. The bin is pretty full — but it’s mostly full of the clothes I bought for Eve, our daughter who was stillborn. 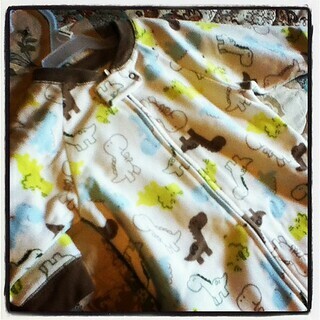 Snuggly onesies purchased in preparation for the winter weather of her January due date. Gingham sundresses for her first summer. At first I put Jake’s things in there because they made me afraid. I wanted them tucked away, just in case the worst happened. Again. But it hasn’t (yet) and now I have mixed feelings about the bin storing the unworn clothes of both my children. Part of me loves having Jake’s things nestled up against his sister’s. And part of me is terrified, supersititously, that what happened to her might somehow rub off on his clothes and cause him to die, too. And yet . . . isn’t hope reckless? And isn’t reckless hope worth having? I want to celebrate this boy. I want to celebrate my daughter. I don’t want to live in fear, although often I do. And hope really is scary. But if a bit of fear is the price of reckless hope — well, that is a price I am willing to pay. Because the reward of hope is far greater than the price of fear, even when that hope is not realized. That happened with Eve. I hoped for her, planned for her, but the hope for her life was never fulfilled. And yet, although she is dead, I do not regret a moment of that hope, that planning. It was a gift I could give to her, and to God, and to myself. It is a gift that I am glad to have given. 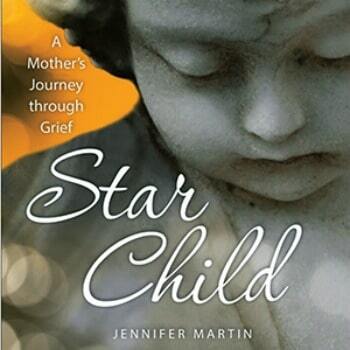 I refuse to plan for our son’s death unless we are forced to. Until then, I will hope, and plan for life. Even (or perhaps especially) when it makes me tremble.